What is Revenue vs Income? This guide provides an overview of the main differences between revenue vs income. RevenueSales RevenueSales revenue is the starting point of the income statement. Sales or revenue is the money earned from the company providing its goods or services, income is the sales a company earns from providing services or selling products (the “top line”). Income can sometimes be used to mean revenue, or it can also be used to refer to net incomeNet IncomeNet Income is a key line item, not only in the income statement, but in all three core financial statements. While it is arrived at through the income statement, the net profit is also used in both the balance sheet and the cash flow statement., which is revenue less operating expenses (the “bottom line”). Learn more in CFI’s Free Accounting Courses. Let’s take a closer look at what revenue can mean by looking at examples of the different types that frequently appear in finance and accountingFinance vs AccountingFinance and accounting may sound similar but there are many important differences of finance vs accounting you must know. This guide will analyze the key similarities and differences between finance vs accounting careers. For university graduates, these are two of the most common options. As we explained above, the term “income” can sometimes be confusing, as accountants often use it to refer to a revenue. The term net income clearly means after all expenses have been deducted. Let’s look at some examples to further illustrate the point. Read through each case below and see if you can determine what you would categorize it as. In accounting, the Income StatementIncome StatementThe Income Statement (or Statement of Profit and Loss) shows performance from operations of a business. The financial statement begins with revenues and (also called the Statement or Profit and LossProfit and Loss Statement (P&L)A profit and loss statement (P&L) is a financial report that provides a summary of a company's revenues, expenses, and profits/losses over a period of time Statement) summarizes a company’s revenues, expensesAccrued ExpensesAccrued expenses are expenses that are recognized even though cash has not been paid. These expenses are usually paired up against revenue via the the matching principle from GAAP (generally accepted accounting principles). For those who are unaware of the matching principle, and net income. 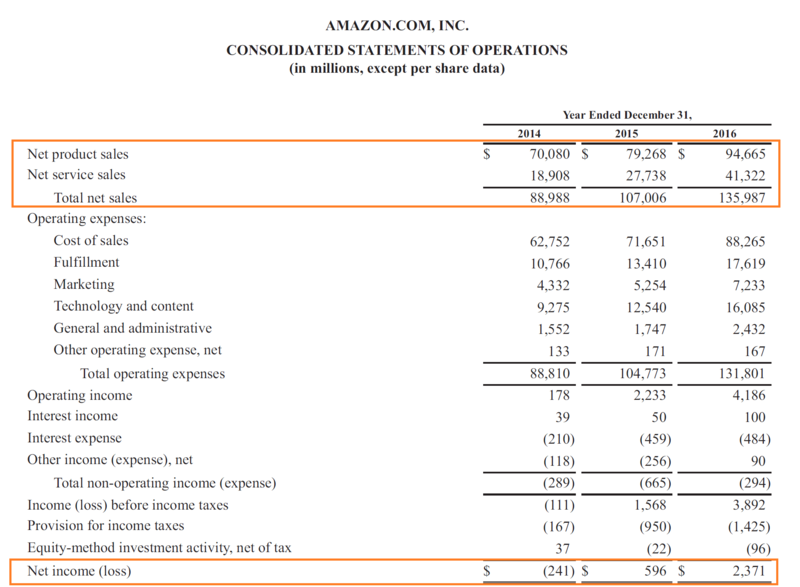 Below is an example of Amazon’s 2016 annual report (10-k10-KForm 10-K is a detailed annual report that is required to be submitted to the U.S. Securities and Exchange Commission (SEC). The filing provides a comprehensive summary of a company’s performance for the year. It is more detailed than the annual report that is sent to shareholders), which contains both revenue (which they label as “net sales”) and net income. Hopefully, the examples above have provided a clearer view of how a company reports certain items, and the difference between top line and bottom line is a little clearer. Thank you for reading this guide on revenue vs income. We hope it has helped your understanding of accounting and financial reporting.